This afternoon I was walking my dog Breezy around my neighborhood and I saw this weird looking car coming down the street. 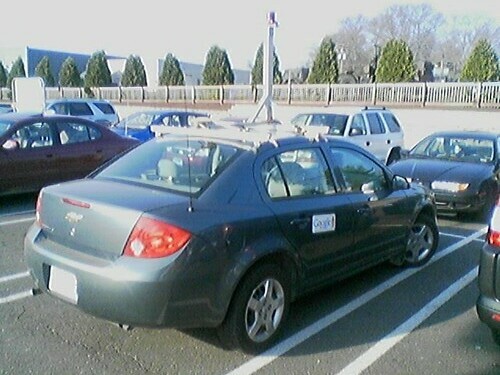 Once it got a little closer, I saw what looked to be a camera on top and then I saw the Google logo on the side. Here is a picture I found on Flickr of a similar car (credit: Frankenstein). I did see the car in time to pose with my dog. I'll keep checking on Google Maps and post a link once I see myself on there. It will be interesting to see how long it take from drive by to posting. I'm looking forward to being immortalized on Google forever. This page took 0.165 seconds to load.